Elected by the American people, the President of the United States is the spokesperson for their nation. Since 1901 the holder of this office has come to assume vast but often imprecisely defined power. President and Nation: the Making of Modern America examines the role of the presidency in the political development of the country since the beginning of the twentieth century. In four wide-ranging chapters - the Development of Modern America; the Acheivement of Liberalism; the Attainment of World Power; the Resurgence of Conservatism - John Kentleton skillfully blends narrative with analysis to explore how successive presidents have confronted new domestic problems and foreign challenges. He argues that effective government requires strong presidents, of whom Franklin D. Roosevelt is the prime example. His period in office illustrates how the wise use of presidential power can achieve reform at home and international leadership abroad, and can sustain the forces of democracy. 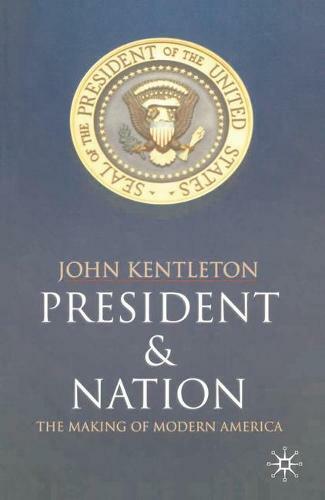 In this topical and clearly written study, Kentleton assesses the role of the President in the making of modern America suggesting that, whilst power may be misused, reluctance or inability to use it may be equally damaging, and denies the great creative potential of the position.